Description: BNSF on the Trunk heading east bound. Description: BNSF 525 leads a local out of Lincoln Nebraska at Fremont. Description: BNSF 525 leads the local out of Lincoln Nebraska into Fremont to setout cars along the line. Description: Looking a little worse for wear the BNSF #524 leads the Q-STPCHC into CP Sullivan shortling after the Z-CHCSSE cleared. 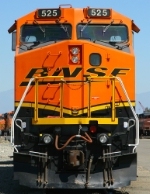 Description: BNSF 525 dead in the Burlington, IA yard. Description: Pretty classy South Local power. This unit could use a fresh coat of Red / Silver or H3! Description: M BARSDG1-13 With BNSF 7721, BNSF 525, BNSF 550, BNSF 7756, BNSF 7723, & BNSF 7726 with 25 Loads 13 Empties, 3475 Tons 2677 Feet. I got real lucky on this shot as it was raining and cloudy, but the clouds parted just long enough to grab this perdy little thing! Photographed at 11:55. Description: M BARSDG1-13 With BNSF 7721, BNSF 525, BNSF 550, BNSF 7756, BNSF 7723, & BNSF 7726 with 25 Loads 13 Empties, 3475 Tons 2677 Feet. Photographed at 12:01. Description: Entering Collier with a brand new BNSF 525 (B40-8W) on the lead.